Updated for compatibility with Schedules Direct Changes. Transitioned to new Schedules Direct API. Fixed duplicate entries in Browse view. Fixed Genre Downloading and display. Fixed a crash caused by invalid schedule data. Fixed startup crash when no lineups were defined. Added Additional error handling for data feed error. Fixed missing program information and ratings. If you are using 10.6 and 10.7 send us an email, for assistance. This version uses the new SchedulesDirect Data feed. 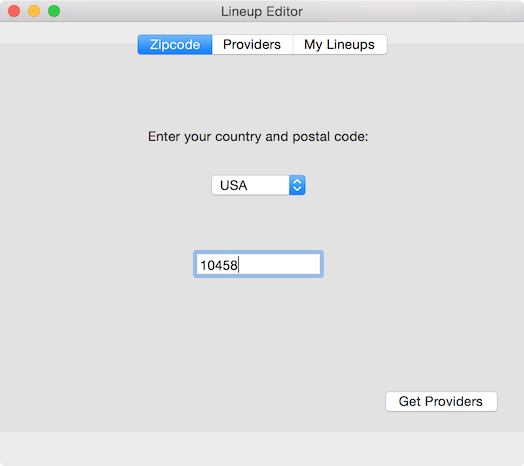 As a result of this switch over, you will need to re-add lineups. 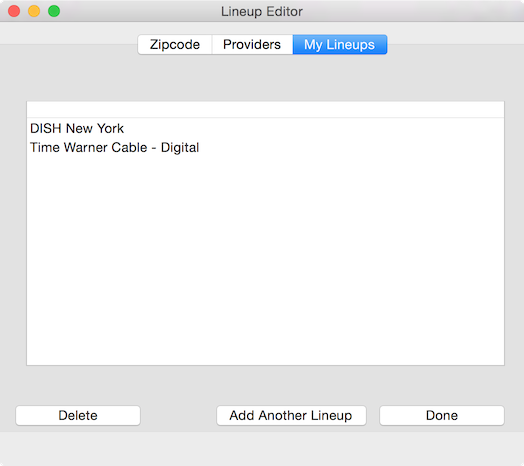 Lineups are now managed right in MacProgramGuide. 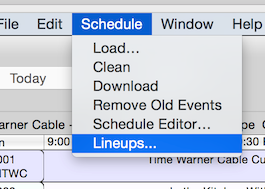 The Lineup Editor can be accessed from the schedule menu. After a couple seconds a list of subscribed lineups will display. Some users have been experiencing issues downloading schedule data. We are aware of the issue and working on an update. NOTE: This version is for OS X 10.6 or Later only, for 10.4 or 10.3.9 download version 0.58 available on the download page. Fixed Navigate Previous jumping 2 hours. Fixed Problem where schedule would be off by 30 minutes. Added sorting preferences for channels in schedule grid. 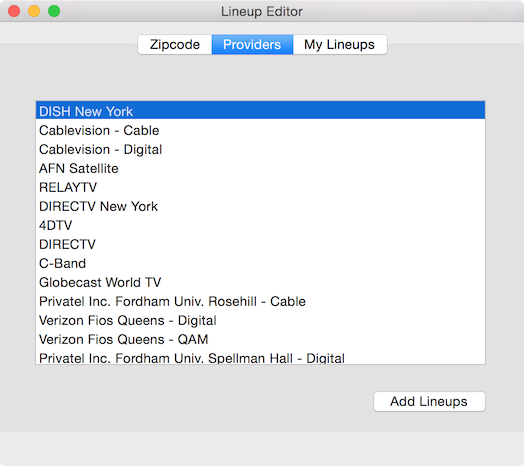 Fixed issue where all channels would not display when Schedule Direct Lineup was changed. Fixed issue where channels would remain when Schedule Direct Lineup was changed and schedule clean was run. Fixed iCal syncing problem that caused a crash at startup. Added Preference to turn off recording sync with EyeTV, this will prevent EyeTV from starting when MacProgramGuide is run. Added Channel number to scheduled iCal event location. Sample Scripts automatically install themselves if no scripts installed. Added Favorites, iCal and Scheduled Recordings to Browse View. Improved Syncing between iCal and MacProgramGuide. iCal events can now be removed from MacProgramGuide. Have you developed a useful script for MacProgramGuide? Share your scripts with other users by sending them to us to host here on the site. Please send only uncompiled scripts, and include a description of the script.